Our bodies have been designed in an incredible way. So many of our bodily functions happen automatically without us directing, influencing or needing to control them. Our hearts beat and pump blood throughout the body. Our digestive system processes food and converts it to energy for us. It is a blessing that our bodies and systems are able to function without us thinking about all that is happening behind the scenes. And even though our respiratory system is also automatic, what happens when we decide to try and control our breath? Think about what happens when you try to hold your breath underwater for a long period of time. The body flips out, and sends panic signals to the brain. Oxygen is vital to our survival and we also need to expel carbon dioxide to stay alive. When we try to take control, the disconnected body does not understand what is happening and will continue to send messages of confusion, fear or irritation to the mind. This is why I love breathwork meditations! Breathwork meditations help us quickly cross the line of fire by understanding the connection between our breath, body and minds, and their impacts on our thoughts and emotions. We begin to confront our weaknesses and learn to trust that the next inhale will come. The increase of oxygen along with praana helps us remember all of the tools of strength and encouragement in our toolkits, which become our solutions and answers when we get stuck. Eventually, a breathwork practice can lead us to becoming aware of other unconscious, automatic patterns that are not serving us. I am delighted to share a few simple effective breath meditations from my new meditation booklet, Find Your Edge Through Mindfulness. The beauty of them is that you can practice anywhere, at any time, and no one needs to know. Segmented breathing is an easy meditation that you can do anywhere. It allows you to alter your state of mind in just 3 minutes. Instead of smooth inhales and exhales, you sniff the breath in and out. Focus on listening to your breath. Energizing and Healing: 4 sniffs in, 1 sniff out. Alertness and Clarity: 4 sniffs in, 4 sniff out. Calming and Grounding: 8 sniffs in, 8 sniffs out. Focus: 8 sniffs in, 4 sniffs out. Calming and Letting Go: 4 sniffs in, 8 sniffs out. Please use the exact ratios above, instead of experimenting with them. More is not always better. 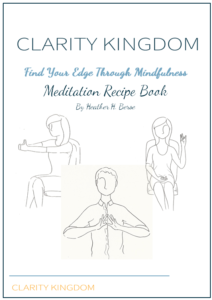 If you are interested in learning more rejuvenating meditations to practice daily, the Clarity Kingdom Find Your Edge Through Mindfulness booklets are now on sale for £29.99 and we can ship anywhere in the world! An e-book version is available for £12.99. Please contact me if you’d like to get a copy!